If there ever was a ‘text book’ for acting, Robert De Niro would be that text book. Among many of the famous characters he played, his fascinating portrayal of Travis Bickle, a loner who degenerates into a psycho cleaning up the scum off the streets of New York or a ticking time-bomb as is often described; in Taxi Driver is a legend. 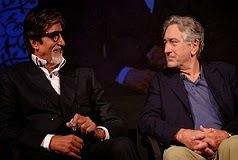 So it was joyful to see two actors I admire the most together on the same platform. The question in my mind, though, is why would De Niro agree to be at some silly THINK fest of Tehelka? Not just because the event is corrupt but because RDN has never been known to speak much. He rarely gives interviews, not known to talk much to the media and even when he does he hardly has much to say. He didn’t say much at the Tehelka THINK2013 either. Shoma Chaudhary eulogised Taxi Driver in her chat with RDN. I wonder if Tehelka can say about itself “It’s clean… it’s real clean, like my conscience” like Bickle says in the first scene about his driving record. I wonder what part of Tehelka’s conscience, if there is one, is clean. Well, RDN is a big supporter of Barack Obama and maybe the secret lies in there. Time will tell. But it does cost a lot to host these legends so you can imagine the funds involved. How a rag like Tehelka operates is explained in my post “The fearless extortionists”. 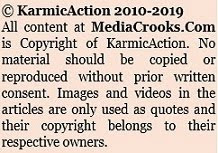 They even used extortion with former Goa CM Digambar Kamat it seems. Someday someone should investigate how the owners of Tehelka have acquired funds for THINKing and real estate worth crores. However, it’s another guest at Tehelka’s THINK that has been catching everyone’s attention. The picture looks funny because it has a Union Minister in it too. If these people weren’t known public figures you could have mistaken it for a reception area where job applicants are waiting to be interviewed. 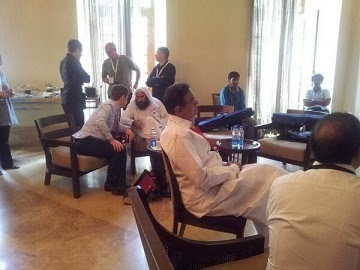 There’s P. Chidambaram and there’s the Taliban co-founder Mullah Abdul Salam Zaeef. Some might remember, Zaeef used to be the Taliban spokie after the 9/11 attacks when the US threatened to attack Afghanistan if ‘Osamaji’ wasn’t handed over. His comic utterances back then sure made everyone have a good laugh. I hope that’s what Tehelka was looking for this time too. Mullah Zaeef came and told the Goa gathering how Taliban had equal rights for women and all. I suppose what he meant was both men and women are stoned equally or had their heads chopped off equally under the Taliban. This invitation of an extremist is not to gain some intellectual insight. It is simply to fool many Muslims in India who still believe Osamaji was good as is the Taliban. It’s like Barkha Dutt running to Imran Khan or Parvez Musharraf whenever there’s a crisis in NDTV or Muslims in India have rioted or been arrested. These jokers assume Indian Muslims can be permanently fooled. Where do they get their inspiration? The politicians, of course! The Congress, SP, JDU, RJD and lately AAP party have made this a permanent feature of their campaigns. Scumbags like Tehelka gently back the campaign. Sometimes “secret admirers” with money bags also dictate who should be at your party. Following up that excellent Talibani Ambassador for humanity Zaeef was Syed Ali Geelani. The Kashmiri separatist was released by the J&K govt (probably with the connivance of the Centre) to meet a visiting Pak diplomat in Delhi. Never mind why the guy should be allowed that meeting, we need to impress Muslims in Kashmir. So Geelani returns the favour the very next day by stating stone pelting and guns can solve the Kashmir problem. I'm sure Muslims are thrilled with such macho statements. Err… Okay, we get it! Now who can possibly disagree with that? Not even the GOI or its spokies have disagreed. Some days back the Congis screamed ‘you can’t steal Sardar from us, he is our property’. So when Arvind Kejriwal went and sucked up to tainted Mullah Tauqueer Raza the Congis screamed ‘you can tear down Bharat Maa banners and you may not sing Vande Mataram but you have no business to steal our Mullah’. Oops! How dare this AK! So Congi liar-in-chief Digvijaya Singh and Tariq Anwar of NCP rushed to Bareilly and repossessed the Mullah and asserted their property rights. Diggy also certified that Mullah Raza is not communal and is a very secular person. Who can disagree with that either? 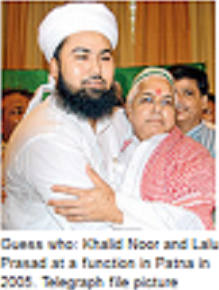 From mere appeasement this has fast morphed into comic fooling of Muslims by ‘owning’ Mullahs. At this rate the Mullahs would be smart to put a price on their heads or auction themselves. But are Muslims buying this nonsense? Shahid Siddiqui, a journalist and also a former member of the SP, earned contempt from his party and other ‘sickulars’ for interviewing Modi and finding a few of his contentions reasonable. (Nothing new, the Congi head in Mumbai has asked Lata Mangeshkar be stripped of her Padma and Bharat Ratna for endorsing Modi as PM). You see, a Muslim journo interviewing Modi is blasphemy but a scumbag like Tehelka inviting a Taliban founder is THINK. That also explains the Congi sympathy for terrorists when the GOI gives visas to such Taliban clowns. It’s election season, let’s keep the Muslims happy. This is where we cut back a bit to the past. 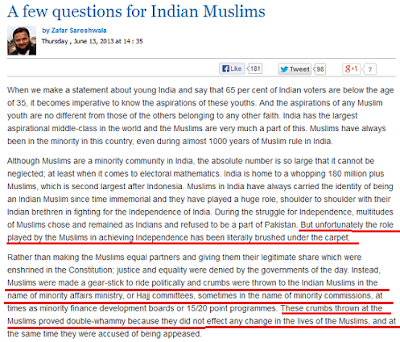 In the 2012 UP election campaign there was Salman Khurshid kicking and screaming for reservations of Muslims. He wanted to prove he was the biggest champion of Muslims and even said he would ensure the rights of ‘pasmanda’ (backward) Muslims even if the EC "hangs" him (that’s reservations for Muslims from OBC quotas). Wow! In recent times there has been no greater theatre to fool Muslims because even Khurshid would have known what he proposed was unconstitutional. Then there was the Andhra govt which announced compensation to Muslim youth wrongly detained by police for terror attacks. I don’t mind the compensation at all but why only Muslims? And there is no law that provides for such compensation. The Andhra HC first struck it down and then withdrew its order for reconsideration. There was Kamal Farooqui who exhibited exemplary moronery by stating Yasin Bhatkal was arrested because he was a Muslim. Of course, don’t forget the Lalus and Paswans who thought campaigning with ‘Osamaji’ look-alikes will tempt Muslims to vote for them. It has taken time for many Muslims to wake up to the fact that many of these politicians had taken them for idiots. Either that or some Muslims certainly need introspection on why some in their community were so inspired by Osamaji. The student, Md Shadan Arfi, wants “fatwas” to be issued against the terrorists and their organisations. That’s an excellent question to all the fatwa-issuing Mullahs. It’s also a question the media and politicians don’t ask of the Mullahs. And if all that isn’t enough yesterday there was a student enrolled into the “Diggy School of Terror Management”. Congi Shankarsinh Vaghela concocted a bizarre theory that BJP/RSS were hiring Muslims, training them in bomb-making and terrorism and inducting them into the Indian Mujahideen. Not just that, the BJP is also funding the Indian Mujahideen says Vaghela. Oh yes! I know of one Ayesha Bano who regularly attends BJP meetings in Delhi under the watchful eyes of snoop-dog Vaghela. I guess Vaghela also saw her at RSS shakhas in Nagpur. She operates some 51 bank accounts to launder hawala money and is in the news after being arrested for allegedly funding the Patna bombers. These are desperate measures at their Himalayan best. Shinde’s letter to all CMs to not arrest innocent Muslim youth can’t be explained by even Einstein. How in hell is a CM supposed to preclude anyone being arrested is innocent? It would have been more sensible for Shinde to say “don’t arrest any Muslim”. The mother of all desperate measures in fooling Muslims came from none other than Dr. Rahul Gandhi, International expert in Terrorism, Communal Riots & ISI. Dr.RG grandly screamed in Indore on October 24 that Muslim youth who were in the relief camps after the Muzaffarnagar riots were being lured by the ISI; obviously for terrorist activities. He also blamed the BJP for the riots. Nothing new from the Congis but the history of communal riots in India has the stamp of Congress all over it. The party also boasts of India's most communal politician. He not only dumbfounded his own party and a hapless crawling media but he even stunned the Muslims. Every Muslim group and organisation had nothing but condemnation for his stupidity. I don’t care if the BJP complained to the EC. I don’t care if the EC takes any action. For once, I’m glad Muslims aren’t falling for these stupid tricks and deceptions. "Fool me once, shame on you. 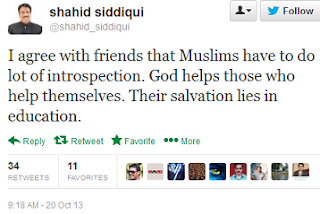 Fool me twice, shame on me" Sareshwala, Shahid Sidiqui and that student are saying exactly that. Desperate Measures series… to be continued. Great article Ravinar. In fact if we are able to separate the ideology from persons, we'll be able to clearly feel for our Muslim brothers and sisters here (who are included among Indians in general). The ideology has to be fought tooth and nail with ideology. So there should be a caution in dealing with persons who espouse the ideology. In this regard, hard hitting articles like this based on facts should help in awakening Indians. Exellant as usual.You have posted a photograph of RDN with Amitabh Bachan.Every one can recall the hue & cry by the sickulars lead by the congis when AB started appearing as brand ambassodor for Gujarat Govt.Now it is the turn of Lata Mangeshkar.It`s hightime -these legends come out openly in support of nationalist forces headed by NAMO..I am sure every patriotic Indian will endorse them. Implementation of Uniform Civil Code is the only medicine to introduce development and remove some of the ills that Muslims are facing because of Mullahs in their own society. Also, politicians just cannot think that possessing a Mullah would ensure that all the community votes will be theirs. Also, yes It is time for a lot of introspection among the Muslim community itself. The youth in their community should see through this game of appeasement played by Political parties and not toe their line. This has nothing to do with the current article per se. Yes, the article is excellent and much needed in current times. Here, I want to clear some misunderstanding many of us carry about the concept of FATWA. I used to understand it as some sort of ORDER given by a Muslim cleric to his followers but meaning of FATWA is an OPINION or clarification given by the cleric on a question raised or needing explanation. I understand, it has no religious compulsion attached. My Muslim friends/scholars should clarify . Totally Agree with you. I have seen few of such idiots. Few works in my company which is US based forutne 500 Company. I really wonder if these species have educated to this level to get a 6 digit salary then why cant they just correct their facts and differentiate between right and wrong. IMO Its impossible to clean their brains. Let them wander in fools heaven. I see some change in muslims in the recent past , all because of modi. due to partition and during partition the two states, suffered most, punjab and bengal. assam will come next. if it is measured in terms of loss of human life, surely , it is bengal and bengali hindus. till date bengali hindus are suffering, both in bengal and bangladesh. some villages, in banladesh, you will not find a single hindu woman who has not been raped. i am talking about recent incidents, not of 1947. bengal is now the main entry and exit point,for business,terrorism and 'chota-mota' crime. it is not easy, you will only be able to realise their total operation if you experience it closely. i travel extensively, especially rural areas and in poll times. you will not believe how political parties cong, cpm,tmc manage poll by them.nowadays i am listening something on the streets of kolkata which i have never seen/heard before, that is open anger/criticism against appeasement and minority. i commented before that they are not fool and can not be fooled.they just change their strategy with time. i am reiterating it as i am witnessing it here and in other places just because of changing political equations. if i agree with it that congress tried their best to erase memories of Sri Maulana Azad(not mentioning other freedom fighters here) what other people of their community were doing for so many years. absolutely nothing. there was, there is and there will be people in their community who thinks differently. but as said by Sir Arthur Conan Doyle - "I hate exception because exception disproves the rule". A very good analysis. All these years, our politicians were not allowing anybody to educate because illiteratres are their votebank. This is irrespective of community. Now it is changing and literate people are questioning the motives. A funny thing is happening in Karnatata - Mr. Sidaramiah CM wanted to introduce "Shadibhagya" (doling out Rs.50k) only to Muslim women (including widows). But he is facing opposition from Muslim themselves apart from his own party. Only awarenewss will bring visdible changes. This is not reported by any MSM so far. @Ram...MSM does not care. They would be happy to report post a mishap at Bangalore rally. Bangalore Police are aware of it and have decided to introduce Special cards even for police personnel to enter venue. NaMo should ensure that there is always one to two levels of security of Gujarat Police around him. Why fooling Muslims is necessary and important for Secular parties? Type "power and reach of Muslim vote" in Google and check to the first link that comes up and navigate to that India today website. 1. The site gives a remarkable good breakup of the Muslim vote in the entire country and will also provide the demographic reasons as to why some secular parties (like TDP, AIADMK or DMK , and BJD) are willing to ally with BJP than other secular parties (SP and BSP, Communists wont due also to ideological reasons). The reason is simply because of the trade off with having a pliant central Govt and the Muslim vote, where they make a informed choice in places where Muslim vote doesn't threaten them too much. 2. Check the picture closely which shows that there are 38 constituencies where Muslims population is around 21-30% of the total population of the constituency, 35 constituencies where they form more than 30% of the population. Unless these areas form BJP's traditional areas where BJP yielded influence in the past (parts of UP and Bihar), they are virtually no go areas for non- (pseudo)secularists (like BJP). So any party which talks about non-appeasement, equal treatment and attempts to NOT polarize people will end in defeat for sure. So either you appease Muslims in this 73 constituencies or attempt at blatant counter polarization. But the catch is if you counter-polarize the vote, you will be branded as communal by the whole intellectual elite,political parties et al in India and will weaken the possibility of gaining allies if you fall short of majority (which is generally the case in Loksabha elections). Evidently there are few such constituencies where BJP has any presence here and where it is available it has no option but resort to counter polarization. 3. Now for the next interesting facet, Read the article again, You will see that there are 145 constituencies where Muslims form 11-20 percent of the population enough to swing the vote towards their favored party since close to 2/3rd seats in elections are lost with a margin of less than 10%. The catch here is Muslims are at a disadvantage if these constituencies form the core areas of BJP. Eg: Gujarat,MP,Rajasthan,Chattisgarh, UttaraKhand, Himachal and Delhi. In these states (where above constituencies are found) BJP will attempt at counter polarization. I see no more than 40 constituencies which fall under these BJP core areas, so still they are left with more than 100 constituencies where they leverage their vote and coerce any regional party from allying with BJP. 4.So there are 218 Loksabha seats where they can be decisive in picking the winner to influencing the election in swaying the parties to do their bidding. So, the Next Question that comes to Mind is Why though its around 20-30%, why has is become so important. 1.Primarily, In Indian democracy which follows first past the post system and when many parties are allowed to compete for the vote, the party which gets just one vote more than others is declared the winner unlike in other countries where certain proportion (50% or above) is needed to register a win. So a Party which can mobilize a certain section of the population through motivation (positively or by fear mongering, the latter happens more common in India) will have a decisive lead. It only needs to scare enough sections who form say 30% of the total vote to register a win. Since all other parties will divide the total vote any way. The win has become a nature number count than what proportion of people think of the party. Adding that only around 50-60% voters actually register, barely a person with 18% vote will usually wins!! 2. Why are Hindus not united unlike say Russians where even Russia has around same amount of Muslims population. The reason here is more cultural, being Abraham nature of faith (Christianity), and the later forms of reform which Christianity has undergone, there are no undue and artificial divisions of caste like in Hinduism. So no matter what you do, Secular parties believe, Hindus can never be united in true sense politically. Historically there are instances where one Hindu tribe sided with Muslims or British to subdue other tribes. PS:Ravinar, Sorry for trolling but its just to provide some perspective and you can remove the long comment after few days. a) Shortages help divide Hindus where a certain, more favoured, section to ruling elite can be granted the largesse ( reservations, caste sub-plans or proportion of treasury to certain case eg:SC/ST subplan in many states) while others can be punished for not supporting them. So Socialist Govts prefer doling out largesse to a section of population (like farmers, minorities) rather than say laying a Decent road which helps everybody. Since socialism's idea that wealth is static, (never growing) ,for them only recourse is to distribute it (effectively distributing poverty). b)secondly, it helps keep these section in perpetual dependence as well as frighten them that any if any other party comes, they are bound to lose out of scare natural resources to them. 4. Pseudo secular narrative, the is the gift of Nehru to India where any intellectual who does not conform to his idea of pseudo secularsim ( Nehru's idea of secularism) is blatantly communal and every intellectual is gauged, weighed and measured according to his standing on above ideas. So the entire socio-poilitical intellectual elite along with media barons are supposed to hold this view in-spite of counter factual experiences in their life. Somebody once said that "Distorted system produces Dishonest intellectual elite" . See barkhas, Rajdeeps etc and you realize what I say. 5. Complacency of the middle class vote, evidently the large middle class (90% of whom are Hindus) doesn't vote. Various factors as simple as laziness, Governmental apathy (parties do not show as much enthusiasm for registering Middle class votes) also contribute to it. This is the only class which can demand things irrespective of their caste like good governance be it controlling inflation, limiting corruption and development. Middle class not only deceives itself claiming " there are no good candidates or everybody is corrupt", even the media in collusion with politicians propagate day in and day out about how crooked our politicians across all political parties are. So this kind of monkey balancing and political narrative more often helps pseudo secular parties than BJP. 6.BJP is against coercive conversion (so not evangelical funds) or not willing to take arab money to fund elections, possibly biggest reason why its activities are limited. Added to that, its main vote base is Urban Hindu middle class (along with Rural OBC vote) which limits it from blatantly being corrupt. A single instance (like in Karnataka) can completely erode its credibility within the state for years to come. Is this problem only related to Muslims? Emphatically NO, Infact this problem exists (for true secular parties) for every section which can be beaten down with fear mongering (various SC/ST atrocities give credence to this idea). I didn't add issues like High level Migration or High Birth Rate among Muslims Since I though it would digress the issue we currently have on our hand. where is the solution ??? Congrats vansi krishna i think u r from hyderabad,u ve written a blog inside blog.and very lucid and logical presentation apart from gas subsidy thing.i too ve been sniggered for too being logical and political.recently in our closed watsup group v had minor skirmish bout communal violence prevention bill.even though i explained my piont a mmuslim friend of me is not talking to me since 1 month even though we are working in neighboring hospitals. We should send the MSM cronies to Saudi for a few months. I would love to hear frm them after they return. Truly fair article Dear Ravinar. Plz. do keep awakening us by your thought provoking posts. He wii do that upto May 2014 ONLY!!! After that if you Indians don't wake up u will be eternal SLAVES of the FAMILY!!! Once again a well dissected post, hitting nail on the head. The true Indians are well aware of the sinister designs of the pseudo seculars and their pre poll marriage of convenience just to appease a section of the society only to disillusion the same section post election. The gimmicks and the dilatory tactics of these so called seculars are being unmasked every now and then through their own dual instincts in public. If Congress and its opportunistic allies still think they can get away with emotional black mails and cheap tactics it's a fools errand. They should realise we are not living in 80's; with so much dessimination through print and television media happening now pouring out whale of information let Congress and their ilks make no mistake of it. Dear Ravinar, Well written article. Hats off to you. Muslims have been deceived by the Congi morons and their paid media partners and journos as much in the name of religion as in the name of material prosperity equated with rate of growth. Religion leading to fanaticism, fanaticism leading to fundamentalism and fundamentalism ultimately leading to terrorism and violence. Its actually muslims who are fooling the world. Time for crusade and hindus should join it. One point that most people overlook is the working of the govt abbetoirs.Whatever be the percentage of muslims in any locality,the slaughterhouses managed by municipality or corporation practice halal slaughter which is the most cruel form of killing.I do not know if developed european countries permit this cruelity. Anand, you are right. I know some animal right activists who tried to convince abattoirs owners to use charge to put animal into coma before killing it and still consider it halal meat because all organs of the animal would still be functioning, they refused to do so. They want to kill animal while it knows that it is being killed. Muslims wanted Islam more than development - nobody in media highlights that there hasn't been any reform in Muslim society. They wanted to remain backward Muslim - Khangress and gang helped them remain such. Sane voices are few and far between. Muslims in Gujrat, especially women realised that the development will come when they are part of the larger set of population rather than a separate subset. DITTO Vineet's comments above ! Education alone is not going to help. There is a legislator (in the house of Congress) in USA who has a medical degree but still believes (and preaches) that the world was created only 7000 years ago. Muslims will have to come out of victim-hood mentality, they stop believing tat the entire world is out to get them. Because of such mentality, psychologically, they remain vulnerable to the vote bank policies. It is amazing how the Muslims are a constant factor in the perpetuation of power, especially in UP & Bihar. In the beginning it was Brahmin-Dalit-Muslim combination of the Congress, followed by the Yadav-Muslim combination of SP/RJD and the Dalit-Brahmin-Muslim combination of BSP. Muslims unfortunately seem to be betting on the same horses that have let them down time and again and seem to be going around in circles as they are back to Y-M again. Unless they get out of this vicious cycle and put their faith in education and progress, they will go round and round in exploitative circles of the sickulars who have a huge stake in their backwardness. The Muslims also have to understand that Indians are basically secular and this alienation of their community fostered by the sickulars deliberately by raising the Hindutva bogey time and again will only ensure that their sorry state of affairs will continue. 1. In my last post, I have mentioned as to why scared minority vote (whether muslim or sc etc ) matters so much and why this en bloc voting has become such a roadblock for healthy democracy. The solution is complex and manifold and unless we do not take the issue holistically (apology for manish Tiwari for using his favoured jargon), we simply cannot counter it. The solutions are not fantastic, I have always wondered how journalists expect innovative or big ideas from Modi or Rahul! what a bull crap, we as a nation failed because we failed to undertake simple steps which should have been taken like getting our act right on primary education etc. Primarily, the solution can be from aggressive to subliminal to progressive. First the aggressive, the only way to counter bloc voting is well "bloc voting", which means counter-polarization. Will this be successful? partly yes. I will give two instances of it. 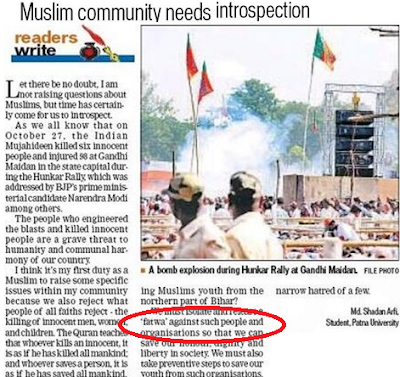 a)When Rahul Gandhi spoke about minorities in contact with ISI after muzzafarnagar riots, most Muslims objected to it and most Muslims in UP are disillusioned about their favored political leaders of secular parties, since Muslims realize that with a strong BJP leader, counter polarization will happen and deepen with his (Modi's) impact, the only reason it didn't work during Advani was because he was seen as a weak leader both ideologically (after jinnah comment) and governance wise (with his lackluster performance as HM of India). Similarly, Muslims objected to Nagpal's suspension on the alleged act of mosque wall demolition, they knew that their (Muslim's) cover of being perpetual victims is being blown away with too much of appeasement. The narrative that Muslims are victims is increasingly under strain with the appeasement policies and they know counter polarization is bound to taken place with effective leader. 1. Every person who has enough awareness about what is going on in this country must express himself fully, my brother usually publishes mediacrooks headlines prompting other to read in Facebook, G plus etc, but somehow I was always weary of doing things lest I was blamed by my friends as too political. You see being political among non-political middle class is a big no-no. But now I have started to change. Secondly, talk to everybody you know whether he is congress sympathizer or a neutral guy, I may not have been successful to compel my congress-voting relatives to vote for BJP (Modi) but have certainly ended their moral dominance among our group. Congress governance (worst of it) has also helped. There were many among us who are silent supporters of Modi but our support must become more pronounced. How do you think modi was able to connect with masses without media's support? simply by having personal discussions with people of influence who themselves had discussion with other influenced groups! 2.No politician can be successful unless the silent majority in support of him asserts its authority. Only by voting and voting alone can the middle class show its strength that it cannot be taken for granted. The middle class in itself is not a huge vote bank but has enough fire power to force a shift in voting percentages and since most of the seats are lost by less than 5-10%, OUR VOTE MATTERS. The campaign for BJP must be YOUR VOTE MATTERS. It has been observed that the more voting percentage goes up, the better leaders are elected. 3.Beware of the Complacency-rascals, Do you know, there are genuine section of middle class Indians who believe voting doesn't matter but you know what, Congress supporters (Govt employees, since they dont have to work under their regime, old socialists, old faithfuls) never support congress in public but will attempt to kill the enthusiasm in the middle class voter by saying words like "Nothing is going to change, all are same, all are looters or theives". There is also a section of upper middle class people whose offspring work in advanced countries and have neither interest nor hope for India, equally so, they hate the idea of others reaching them. Please ignore them as they are new age racists. 4.Vote even when BJP or any right wing party is losing, when you vote, you are not just voting for an expected candidate to win but also voting to express your idea of India, Idea of Governance or even Idea of how not the political leaders should be. .Your vote basically establishes an ideology. This is called committed vote bank, for instance, in Old city of Hyderabad, where Muslims are in majority, Hindus continue to vote for BJP, even if it loses, pronouncing the unacceptable politics of MIM(the guys who want to exterminate Hindus if police stay away). 5.Weary of Media, Most of the media, as Ravinar rightly proved, is compromised. 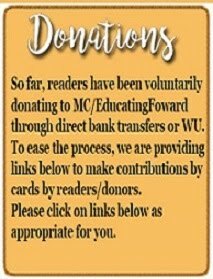 Keep updating your information from internet both from left and right wing sites to get the right idea and continue to blog. Do you know many of the ideas that BJP or AAP has got from bloggers. Do you know most of the information that Americans now get is from internet and social media. The above points are some activities that as a patriotic voter can do. But to complete the curve, only a centre-right Governement can achieve which I will publish things in my next post. Ravinar: I do not wish to chock the comments place, but bare with me. 6. Don't be apologetic as a Hindu before people of abrahmic faiths and be critical in counter their subtle contempt against our faith. Every Hindu (or sanatan dharmi) must have experienced a subtle degradation about Hinduism by people of the book at some point or the other. I have seen my Hindu friends being overtly apologetic about BABAS in Hinduism, forgetting even worse cult-personalities among people of abrahmic faiths. By only resigning us and them to our respective fates/Karma, we have not made the problem go away. For Instance, I have started to speak openly with my office colleagues (outside of course!) about appeasement policies of Congress even when non-Hindus(muslims) are around and even when Hindus are in minority in our group. The more logical your points are the more acceptance you will get. I was able to first convince a my Muslim colleague that Indeed congress policies doesn't help, instead, it will alienate muslims from the mainstream. Once convinced, I have started more right-wing ideas, liberal policits, and away from congress fabian socialism, Congress history, at the end of few months, I have almost converted the guy from Congress supporter to Modi supporter. I am not sure whether he will vote ever for BJP, but I am sure, I have discounted one more pronounced supporter of Congress and made him at least think. So, I have not only was assertive about our faith but also more also subtly warned that counter-polarization is no longer a dirty word among Hindus now. Strangely counter-polarization is no dirty word, as ravinar pointed out, in America where several racial groups vote according to their political preferences. What BJP needs to do once it comes to power (assuming it wins 2014 of course). 1.Vajpayee had been too apologetic as a Hindu, his Delhi cabal didn't help him in countering the leftist-socialist ideology. He also had little time to counter it as he wanted to improve the country strategically and economically which he subsequently did. But Modi is not Vajpayee and is more aggressive. So People who are in support of him must do so in a more assertive manner. 2.BJP must go for COMPULSORY VOTING, this is the only option left. When our forefathers thought of liberal values and banned communal awards (where only minorities vote minorities and majorities the majorities), they thought this communal appeasing will never raise its ugly head again. They were wrong. This is the only way to counter en bloc voting and will ensure that majority Hindu opinion is mandatory before you make any bill. So the only way to perforce ensure majority opinion is, well, by compulsory voting. BJP knows that a law passed for compulsory voting may not have support either in legislature or goes well with the people. The idea is rather INCENTIVE FOR VOTE. This is not a bribe to vote certain individual and certainly not a corrupt practice. Countries like australia has compulsory voting but is also implemented strictly by imposing small fines. So how can you ensure voting from non-voting public. Simple, India still has some socialist leftovers which can be used for public good. Every middle class person in this country fears about GAS connection, MORE THAN 90%, of the middle classes use subsidized connection. Modi must promise that 10% of the subsidy given in the first year will be based on their vote, incrementing it to 10% every year. At the end of 5 years, half of the subsidy will be based on his voting. So this can be implemented with IT, Aadhar cards are already available, election cards must be connected to Gas ID's of middle class families and convince them that voting will be incetivized with Gas Subsidy. Rural voters do not need this as they do not need any motivation. In a matter of ten years all the subsidy will only be given to people who voted!! By that time, hopefully, middle classes have been enough empowered to realize the power of their vote. 3. Do you know why Minorities vote more in proportion than Hindus. Other than scare mongering, one of the biggest reasons is economic. Modi's idea of non-appeasement should ensure that every member of the minority will get his due in the development process. Do you know, Congress memebers ( and its assorted leftist liberals) willingly ignore minority areas of good schools, good medical facilities. You can argue that not paying taxes will not give you good roads for colonies by education must be good irrespective of your status or particiaption with Govt. Modi must bring development (he will by Gujarat example) to every muslim be providing Good schools and other better facilities to them. This may not make them vote Modi, but the more muslims move into empowering classes (some already do), the less they are willing to vote!! This will in effect bring parity with Hindu middle classes. The more empowering the muslims become, the more they demand of the leaders. The more they demand of the leaders, they will either have to change, or people change their leaders!! This in fact is the major worry for the congress. 4. Complete clampdown on conversion activities, Clampdown evangelical NGO's who are here for conversion rather than anti-conversion bill at national level, since its not possible. Secondly there is stinking corruption with these NGO's who pocket most of the money coming into India. Completely exposing this racket, will help cut down evangelical money from Christian countries. Being in centre is easy to clamp down NGO's than in states since money laundry provisions can be used. 5.There is no better strategy than developement, SC's convert because of lack of development. They are given only peanuts in the form of reservations or few special previleges, the more the country gets back to its development path, the lesser the compulsion for seeking economic benefits. 6.More Parliamentary consituencies, Modi can keep the same proportion of state's count in parliamentary seat count by increasing it by a third. So 33% more parliamentary seats can be increased by invoking the emotional women's reservation bill, promising the added seats to compensate for the lost seats for the general category. No one will object since women are getting reserved and male members do not lose their seats. But the counter effect is even greater. For example in parliamentary seats where minorities influence with 20-30%, their vote will be marginalized as they get their own parliamentary seats!! For example again in Hyderabad constituence, only 30% vote is hindu, by dividing it, Hindu vote can be saved. Similary in consituencies where minorities influence three contiguous seats can be given one additional seat from which now they could only influence only 1 among four, instead of three among three. 7.Finally draw away Shias, bohras and other liberal muslims from the sunny muslim cabal and its leaders. One political parties know that BJP has committed vote among certain sections of muslims, it will no longer be communal! Just like mulayam or mayawati is no longer communal though they pander to certain communities, the committed vote ensures they are treated as communal. This can be done in constituencies where BJP is already the winning candidate and pronouncing more support for Shia AIMPLB exclusively for Shias, Women AIMPLB etc. BJP must say that its not against muslims but is in favor of more liberal muslim laws like Turkey and not with demonic laws from countries like Saudi. 8.Complete clampdown on illegal migration from Bangladesh and warn congress that it will attempt complete open borders with Nepal to allow illegal hindu nepalese to counter it. It will also bring special brings to safeguard Assamese native tribals to the extent of passing bills favoring innocence even when tribals take voilence against bangladeshis openly. the committed vote ensures they are treated *as communal. Should be read as the committed vote ensures they are not treated as communal. For the 6th point, I mentioned about increase in parliamentary constituencies. once most of the minority voters have their own parliamentary seat where they form majoirty, they no longer require secular parties like congress which makes Congress vie for Hindu vote as muslim vote now openly goes to their own religious parties. Do you know this happens in kerala, where marxists subtly polarize Hindu vote!!! BJP does not exist in kerals so most of the Hindu vote goes to communists. The onlly difference is communists get the Hindu vote but still abuse them, thats the difference. 8.Industrialization and Urbanization: Perhaps no single act can unite Hindus as much as urbanization and industrialization which is helpful in diluting the identity of caste which they have at rural level. Since cities enable people to compete based on skills and not with legacy or profession(caste), Govt which comes in 2014 must quicken industrialization and urbanization. 9.Abolishing endowment department, if there is any act which destroyed the influence of Hinduism in India, it is the endowment deparment which is not only a cesspool of corruption but its mismanagement has ensured many to be away from temples. Autonomous department like EC must be created and let it run and be given administrative powers like appointing and giving salaries. Best people must be appointed based on their past record. 10.Reform in Hinduism: Yes, Reformation in Hinduism is not complete, since brahmins (or kshtriyas) no longer hold any power in India now. Temple priests can now be trained from all the castes, where children of different castes can be taken and trained up. In shiva temples where little need exists for learning Vedas and the puja rituals are nominal, retired and interested people may be nominated as priests. Even in rural areas of Karnataka and AP, Brahmins no longer conduct marraiges because of non-availability. b)Temple reformation can give huge amount of funds and Hinduism if it has to survive needs to take prosletization techniques of Christianity, where it needs to create a template to returning converts back to Hinduism. 11.Tackling reservations: The single biggest stumbling block to uniting Hindus is reservation where no group wants to leave out their previleged status, rather than banning include forward castes too with nominal representation. Just provide 0.5 percentage to Brahmins, vaishyas and kshatriyas (who are from economically weaker backgrounds). This will weaken the narrative of forward caste dominance. Govts can encourage intercaste marriages (like Tamilnadu in 60's), initial resistance from khaps will not only be won but any pressure from khaps will only be counter effective in making BJP a more Hindu reformist party. Khaps are slowly losing their preeminence anyway.